Sometimes the sky held only clouds, but at other times it could get quite busy. It could be full of sailing ships or bands of mounted warriors or even single figures strolling carefully across the empty air. From the viewpoint of those below they were either apparitions or gods, but in any case to be ignored. From the viewpoint of the sky walkers, those below were neither phantoms nor gods, yet certainly always beneath their notice. Because the time had come when one of the sky walkers was going to do the incredible—fall through. And when that happened, all hell was going to break loose. And did! It’s not fantasy. It’s science fiction, and you never read another novel like it! This week’s review is brought to you by reader and commenter Headless Unicorn Guy, who contacted me a while back to let me know that he had some books sitting around that deserved reviewing. He sent me this one and here I am. It’s a doozy. The back of the book makes this whole thing out to be a lot more weird and experimental and original than it is. Whoever wrote that for DAW didn’t read the book, which is not unusual, but they also didn’t read Roger Zelazny’s Lord of Light, from which this text cribs a bit heavily in some places. There’s got to be a term for a narrative that features humans with godlike powers (due to technology) lording it over humans that are stuck in a sort of cultural and technological stasis because of it. It’s a plot similar to the idea that gods are aliens with high technology, but different enough to be notable. The former is a little less trite, at least. Although not directly applicable to this book, I’d like to state my adoration for Brian W. Aldiss’s term “Shaggy God Story.” This book isn’t one (it refers to the sort of story where, for instance, two aliens land on a planet named “E’eduhnh” and their names are “A-aa-dm and E’v’e’e”), but I wanted to bring it up because I just now read about it. Once you get past that, though, the rest of the book is pretty solid, actually. Our hero is a dude named Signi Signison. Like everybody else in the book, he’s from a place that is a direct analogue to someplace in Earth’s history. I guess he’s some kind of neo-Viking. He makes frenemies with a guy who is a sort of neo-Celt, and they arrive at one point in some sort of neo-Rome, and it goes on. At least in this book those things are given a reason. It’s not a great reason, but at least its there. We don’t get the lowdown on the gods of this world until very late in the book, but we can skip ahead a bit. The crew members of the ship who kept all the technology basically each picked a culture they liked and modeled their followers after it. After many, many years, the cultures they were emulating were forgotten but the customs remained pretty much the same. But wait, there is something original about this book! This is where the real meat comes in. This is the part I like. See, this planet, Melior, was pretty crappy when they found it. It was about the same size as Earth’s old moon, and about as hospitable to boot. The scientist gods terraformed the crap out of it using some unknown techniques, but one thing they did essentially defines the planet. They put up a sort of force field to keep the atmosphere in. This is where it gets good. See, the force field is somewhat pliable. It doesn’t bend much, but you can cut it. You can also walk on it. Society got stratified so that some people live on top of the force field and others live on the ground below. After a while the two societies began to diverge evolutionarily. The people on top of the field consider themselves denizens of the Middle World, while the gods live above in glory and the Neathings live below in depravity. Ships ply the force field between nations. This is where Signi comes in. He’s signed up for a ship to earn his lot in life. Said ship, a trading vessel, sets out. Signi thinks things are going pretty well. He meets up with a guy named Tamlin, a member of some rival civilization to Signi’s, and they swear eternal enmity to each other until it turns out that they’re both being duped. They get sold off to slavers so that the ship can pass. Tamlin goes down fighting but Signi gets sold off again to some guy named Darya, a son of the emperor of a place named Nasron. Things go okay for a little while until Darya’s brother takes the throne and gets all crazy. Darya is a good guy, he’s against slavery and stuff like that, but his brother, Naresh is a nasty character. There’s some fighting and Signi decides to escape on an aircraft designed by this guy Augrim. The gods of Melior expressly forbid developing technology. One of the commandments of the church is something like “Thou shalt not know too much.” Augrim has been developing his airplane in secret, but Signi knows about it and forces Augrim to fly him away. They don’t get very far until the middle of the book happens and they fall through the force field into the world below. What is it with books that start out one way and then get on with the story as close to the midpoint as possible? We could have done without most of the first half of the book. Also, this book’s plot is not nearly as expansive as its worldbuilding. As you probably expect, Signi meets up with some of the Neathings and learns that they’re not all that bad. They are divided into separate cultures, but they all get along. There are folks that fly and folks that swim and folks that don’t do either but they’re good metalworkers or something. Very fantasy. The book does a lot to take a fantasy setting and set it up using technology and futuristic evolution and stuff like that. Signi also meets a guy named Weldon who is also a god. Weldon explains to Signi the whole deal with the gods, which we’ve already been over. They’re effectively immortal and have some crazy tech that lets them get away with whatever they want. They’ve been running this show for ten thousand years. Weldon tells Signi (and us) about what led them to this planet. It’s your basic “Earth got crappy because of people being people” story. For a while they all lived on the Moon, but that got crappy too, so a colony vessel set out and found Melior. The crew members set up societies based on their own preferences and, for the people’s own good, set restrictions on technology. The gods don’t interfere directly with goings-on, but they do send down commandments and do things like mating with regular people that they find attractive. That last bit comes into play later. Oh, and Signi meets up with Tamlin again. He fell through the force field earlier and has set up with the Neathings and learned their ways. He no longer has a blood feud with Signi, which makes things easier, and they go from frenemies to just pals. It’s from him that we learn a lot about what’s going on with all the regular people. Signi and Zilith, a woman who can fly with wings fastened to her arms, learn that the Nasronites have gotten interested in coming down to the surface to round up slaves. Such a thing is supposed to be forbidden, but apparently the gods of Melior care about as much about their commandments as the gods of Earth, so they get away with it for a while. Signi and Zilith wage war against them, however, and that’s essentially the end of the book. Signi and the Neathings (a good band name) win the war, as you’d probably expect, and it’s revealed that Signi is Weldon’s son so he gets to go to live with the gods if he wants to. Pretty nice. So this book doesn’t have much of an inspired narrative, but at least the world was interesting. I got a big kick out of a lot of things, and I was surprised to see that the “gods” didn’t turn out evil or something. They’re just people with technology, albeit cowardly people on the main. I fully expected them to be overthrown as an affront to the dignity of man, but that wasn’t the deal at all. Signi was a pretty believable hero. He wasn’t all-powerful (even if he was half-god), but he was at least competent. I love that the back of the book said I’ve “never read another novel like it!” when that is very much not the case. Sure, some things were new to me, and I appreciated them, but this whole book was just derivative. 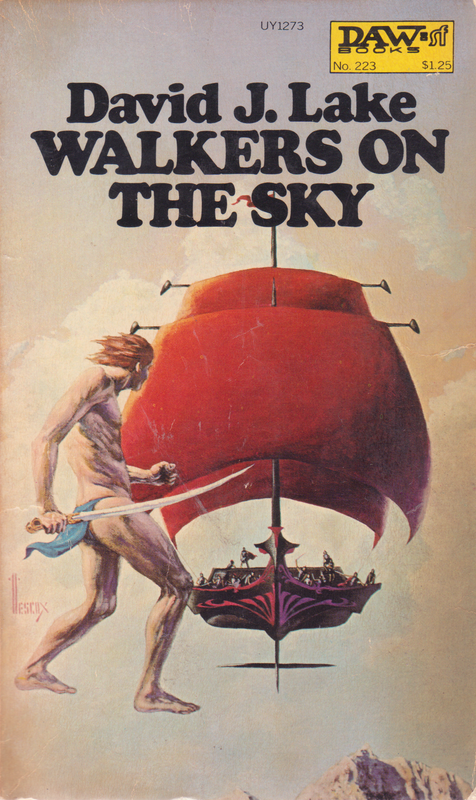 It was fantasy sci-fi that used some hyper-advanced tech to justify the fantasy setting while the fantasy setting justified the stilted dialogue that went “Prithee ye and hark yon” just a little too often. Still, that was broken up by people who just spoke normal English. I wasn’t sure what caused that kind of dialectical shift. Sometimes it was a bit jarring. Notable, though, is the fact that prayers ended with “Amen, over, out,” which amused me. There was a lot going on in this book and a lot of it was handled competently. It’s just a shame that there wasn’t much going on that was relevant to the story, such as it was. It flowed well and was very readable. I do recommend the book if you’re into this sort of thing. If you’re into well-built worlds that make a good amount of sense even as they toe the line between magic and technology, then this is a book for you. If you’re into characterization and story, which is where I tend to fall, then maybe less so. Still, I’d kind of like to steal some of the elements for a homebrew RPG campaign. I think the setting has a lot to offer. Perhaps amusingly, I have a copy of the sequel, The Right Hand of Dextra, sitting around here somewhere. I picked it up some time ago and didn’t realize until I was doing some research for this review that it was the same author, let along part of the same series. I’m glad, then, that Headless Unicorn Guy sent this book my way. It was a joy to read, and now I’m justified in reading the next book which I didn’t realize was a “next book” in the first place. I imagine that I would have gotten around to it and then seen that it was a sequel and either gotten mad and finished it or just put it aside until I found this one. That kind of thing happens a lot. David Lake’s got a bunch of interesting worlds; there’s at least one more in the series that includes The Right Hand Of Dextra (which is the one I discovered). Dextra, I think, is the more appealingly odd book.